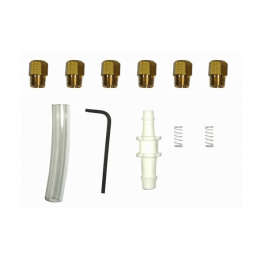 The Goodman LPKMOD060CF Liquid Propane (LP) Conversion Kit is for Modulating Furnaces. This natural gas to L.P. (liquid petroleum) gas conversion kit allows Goodman or Amana brand modulating furnaces to be used on L.P. gas applications. The appropriate kit must be matched to the appropriate model number for safe and reliable operation. This kit designed for Amana Model # ACVM960604CX and Goodman Model # GCVM960604CX. Upon opening the kit, please verify that all parts are in an undamaged condition. IF ANY DOUBT EXISTS ABOUT THE CONDITIONS OF ANY COMPONENT WITHIN THIS KIT, DO NOT USE THIS KIT AND CONTACT YOUR SUPPLIER FOR A NEW KIT.